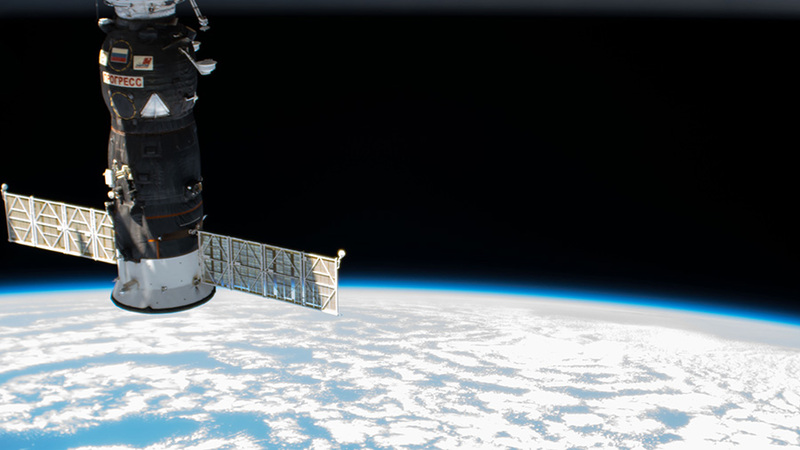 Russia’s Progress 68 resupply ship is pictured docked to the Pirs docking compartment as the International Space Station orbited over the Atlantic Ocean south of the island of Bermuda. A Russian cargo craft departed the International Space Station this morning after completing a six-month stay at the Pirs docking compartment. Meanwhile, the Expedition 55 crew is less than a day away from beginning the fourth spacewalk this the year for orbital lab maintenance. Russia’s Progress 68 (68P) resupply ship flawlessly undocked from Pirs this morning at 9:50 a.m. EDT. It will orbit Earth for a month where Russian ground controllers will conduct a series of engineering tests on the 68P. The cargo ship will then reenter the atmosphere April 25 loaded with trash and discarded items for a fiery but safe demise over the Pacific Ocean. While a pair of astronauts are finalizing spacewalk preparations today, the six Expedition 55 crew members spent an hour today reviewing emergency roles and responsibilities. The four astronauts and two cosmonauts practiced communication procedures with each other and mission controllers on the ground. The crew also checked the location of safety gear and followed escape routes to their Soyuz vehicles in the unlikely event a crisis would require evacuating the station. Finally, spacewalkers Ricky Arnold and Drew Feustel have their tools and suits ready for Thursday’s excursion to install antennas and replace a camera assembly outside the space station. The duo wrapped up final reviews today with Flight Engineers Scott Tingle and Norishige Kanai who will assist the spacewalkers in and out of their spacesuits. The spacewalk is expected to start at 8:10 a.m. tomorrow with NASA TV beginning its live coverage at 6:30 a.m.
Just seen the ISS pass over Salisbury, UK approx 9:05pm BST. Could see the supply vessel following behind. Amazing. I was able to see the ISS and the Progress 68 for nearly 4 minutes, from a UK location, near Derby, this evening (28th), from 21.03 local time onwards. Didn’t expect to see the P68 ‘following’… pleasant surprise. I have just watched the ISS pass over Southern England from my yard in Chesterfield , Derbyshire, (53.2363°N, 1.4354°W) at 21:06:19 hours. It passed very close to the moon but as i watched i became aware of another object following very closely behind it, not nearly as bright, but very visible literally less than a second away from the ISS, same speed, same line. It was still there following the ISS 3 minutes later as it disappeared from view. Was it the Russian cargo craft that left the pirs docking compartment earlier today, 28 March? i wondered what was following the iss tonight. The Progress cargo craft that had undocked earlier on Wednesday. Could 68p have been seen from UK at around 9pm this evening around 4 degrees of sky behind the ISS but following the same trajectory? Thanks guys, it was very interesting! Technological and the advancement for the best of humankind.